Greenwoodochromis bellcrossi by Thomas Andersen. A spectacular deepwater species from Lake Tanganyika. Otopharnyx selenurus by Patrick Tawil. The crescent-tailed relative of the dolphin cichlid from Lake Malawi. Australoheros Part 1: Taxonomic History of the Genus by Willem Heijns. 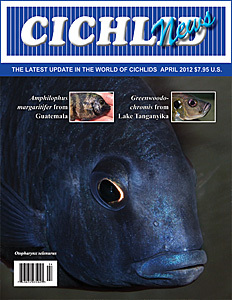 An introduction to the group of South American cichlids known as “chanchitos”. The Enigmatic Amphilophus margaritifer by Eric Hanneman. One man’s quest for this elusive Guatemalan species. My Favorite 6 Cichlids by Chuck Rambo.